For the next gutter replacement project for your home in the Lebanon, Missouri, area, choose beautiful seamless steel gutters from ABC Seamless Siding & Windows. Our designer gutters are engineered to provide your home with decades of protection from rainwater damage, even as they enhance its appearance with their sleek, seamless steel look and moldings that blend with the architectural style of your home. 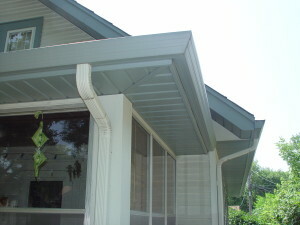 To get the long-lasting looks and strength you want for your new gutters in Lebanon, MO, or a neighboring area, you’ll want to choose a company that’s dedicated to excellent craftsmanship and has expertise in the proper installation techniques. When you choose ABC Seamless Siding & Windows to handle your gutter replacement project, factory-trained technicians will measure the contours of your home and custom-manufacture gutters to fit without the need for seams – those unsightly connection points that are necessary when sectional gutters are pieced together to form the required trough. Eliminating the seams makes your gutter replacement system look better, but more importantly it also improves structural integrity because the seams are typically the weakest point of a gutter system. Over time, those seams can loosen and allow water to escape. Our seamless gutters and downspouts are made of heavy-duty steel that’s galvanized to prevent rust and secured with screws and steel fasteners so that they will stand up to fallen branches and heavy snows better than aluminum. Our gutter replacement systems can carry 33 percent more water than typical K-style gutters and include larger downspouts, which means water from your roof will be diverted from your home as intended, no matter how heavy the downpour. We offer a 20-year warranty on our gutters, plus five years on workmanship, so that you’ll receive some of the strongest protection of your investment that’s available in the industry. For more information about the benefits of a seamless steel gutter replacement system for your home in the Lebanon, MO, area, contact ABC Seamless Siding & Windows today.